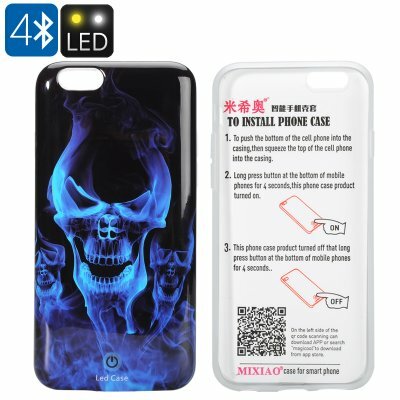 Successfully Added LED iPhone 6/6s Case - Skull Design, 5 LEDs, 300mAh Battery, Free App, Call Notification, 10 Hours Usage Time to your Shopping Cart. Enjoy the colorful lighting effect as the LEDs respond to the rhythm of your music. This iPhone 6 case with its smoky skull design is more that just great protection for your phone. As well as keeping your beautiful iPhone 6 safe from dirt, scratches and drops it will make a real statement about your mysterious soul. The case has 5 built in LED lights that illuminate the case in different hues and can be controlled via the free iPhone App. This adds extra depth to the case and brings great functionality to the case. Not only will the case look cool but it can change color in time to your music, or light up when you receive a call like a ghost calling from the depths of time. The 5 built in LEDs are powered by a rechargeable 300mAh battery that has around 10 hours of usage time from each charge. If you’re looking for a unique and stylish case that can be customized to suite your style then this Led iPhone case is just the ticket. This LED iPhone case is brought to you by the leader in electronic devices as well as wholesale phone accessories..